“Sarah Ellis is one of Canada’s most successful writer of children’s books (Back of Beyond, Ben Overnight, and several volumes in the “I, Canada” series). She is also a critic, a teacher and a librarian. 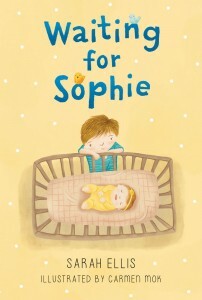 Utilizing the trope of “new baby – concerned older brother – problem with new baby – happy ending”, Ellis begins her story with Liam, who looks about six, being woken up by Nana-Downstairs, a hip lady in pants and designer specs. Mom and Dad have gone to the hospital because new sister Sophie is on the way. “[Sarah Ellis] constantly writes strong stories that have lasting impact for her audience. Many remain on my ‘keepers’ shelf to now be shared with my granddaughters….